Friends, I hope you all had a wonderful Easter with your family and loved ones. I’m finally sitting down to process the challenges that God is calling me towards and to invite you into this journey that I am taking called the Contentment Challenge. I’ve always had this challenge on the back of my mind but never pursued it. I knew I needed to do it but always convinced myself that I was disciplined enough to harbor my spending and denied that I, in fact, was NOT in control of my spending (along with numerous other areas of my life). To give you an idea of how I got to this point, I want you to come back with me to last Fall. Joe and I had just come back from a summer in Boston and I was looking for a new job. God blessed me very quickly with a job where I was making multiple factors more than I had been making at my previous job. All of a sudden, our budget opened up and we had more than we were used to. My head told me to be a responsible steward with my money and tuck away 20% into our savings (which we did) but we still had a lot of room to work with. We had money to do whatever we wanted and I have to admit, I probably let myself go a little too far on many occasions. Looking back, I regret not using more of this money to further the Kingdom, to help those in need, etc. Alas, my flesh is weak and the pull of this world is strong. I let myself do whatever I wanted the first three months of 2019. I took multiple vacations, had multiple shopping sprees, had lavish date nights, etc. and then one day, I was enjoying a pleasant night in with my husband in our new home and feeling grateful and it all hit me in my face and I felt sick to my stomach. We had just moved into a new home and I was happy, truly happy. I was grateful to God for all of the blessings that he had provided to us. I was happy because I felt like I was an adult and that was when I realized how immature I still was and how selfish I had been. I look a long deep look at where my heart was and realized that I was not in the right place spiritually. My flesh was weak and this was evident in the way that I had been turning to material things. We had been blessed financially but I had not been utilizing it in the way that I knew I should! “God does want us to have wealth.. so that we can steward and transform the earth” – one of my friends said this to me and it really resonated with where I felt my heart needed to be. I have prayed over this and finally, feel like I am in a place where God is truly calling me to taken contentment in Him and let go of my worldly possessions. I’m going to be taking a page out of Nancy’s book for this challenge with a few tweaks.. so here we go. The contentment challenge is going three months without purchasing items, clothes, house decor, anything that is not a necessity, etc. · For the next 7-10 days, your homework is the following: prepare your heart, organize your closet, and make any necessary purchases that you might need during these months. (This is not a last minute shopping spree! This is one final trip to the store for items you will need). · Choose 1-3 inspiring books to read during this time. · Gifts are okay! If someone gives you a new dress or piece of décor during this time, receive it graciously! If you need to buy someone else a gift, by all means, do so. The point is not to be rude, but to learn more of ourselves and the Lord. · Necessities are okay! If you break your phone, go get a new one. If you lose your glasses, buy a new pair. Just don’t start justifying purchases for items you already have. · Food: please buy food for yourself and your family. For Joe and I, eating out has been an area where we feel called to reel back. 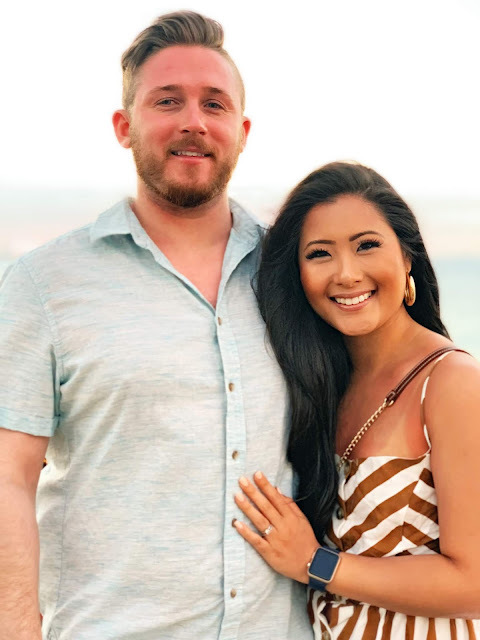 We will be maintaining our date nights (because this one helps our marriage tremendously) but will have a strict budget so that we will have to use our creativity to pursue date nights in ways that don’t just involve eating out. · You must actively pursue something – anything – that replaces your tendency to buy stuff. Begin thinking about doing something you love or a hobby you’ve always wanted to do and make preparations to actually do it. · Our anniversary falls within the 3 months we will be doing the Contentment Challenge. We will still be celebrating it but I just won’t be able to do the things I usually would (aka buy new outfits for the entire weekend, etc. and we will probably not be doing gifts because we are pursuing no further material items during this time. However, we are not going to limit experiences. I know that God is calling out to me, begging me to lean on Him and to take joy in Him. I think every life-changing encounter I have had with God has always come at a time when I feel defeated or am fully convicted like I was this time. I think it’s time to stop acting like a child and stop using our money just because we have it. Now is the time to buckle down on our financial goals, become debt-free, and pursue a future where we can be stable and take care of our children and parents if that time comes. It’s hard for me to share my flaws with you all and my testimony stems from pursuing and learning to let go of perfection. But I do share this with you all because my original intent of this blog has always been to uplift, encourage, and to share the love of God. I hope if anything that this encourages you and allows you to receive a different perspective and I do have one thing to ask: I ask that you keep us in your prayers as we pursue this challenge. Truthfully it will be challenging, it will stretch me outside of my comfort zone, but my greatest hope is that I would draw nearer to the Lord during this time. Contentment Challenge here we come! Wait, can someone please explain to me how it is already April? February was a short month and then March was a whirlwind. I feel like our family is always transitioning and getting used to change which is totally okay because I personally thrive off of change! It seems like just yesterday my precious puppy was 8 weeks old and now he will soon be 6 MONTHS! We are nearing the end of two years in our first home together and will actually be moving into another place this weekend. Thinking of all the memories that we’ve made here makes me so emotional I could cry! Gosh, now I’m tearing up but what else did you expect?! Naturally with moving my focus has been on home decor. 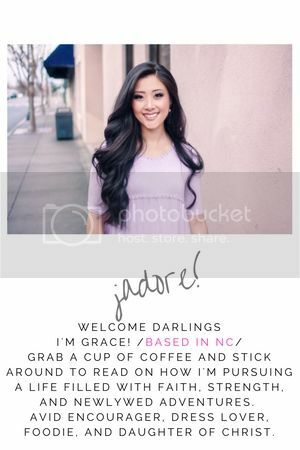 I have a list building up of all the things I have my heart on… haha. Here are just a few of those things. I love my blue and whites! Serve my husband well as he starts a new season of rotations in the hospital! Celebrate Easter and rejoice in the resurrection of our Lord and Savior! Brainstorm the potential for a garden! We are heading back on the plane from Puerto Rico and we have enjoyed a week of beautiful beaches, friendly locals, the pastel-colored streets of Old San Juan, the beauty of El Yunque (The Rainforest), the intimacy of Vieques and Culebrita, and eaten way too many burritos. It was our very first trip to Puerto Rico and it did not disappoint. It did come with small pockets of stress and deep pockets of extreme relaxation and I’m going to share with you a travel guide to help you learn from the mistakes we made and to also help you plan your itinerary. I’m breaking this Travel Guide down to explain the specifics of transportation, What to pack, Where to Stay, Things to do, and the best restaurants to eat at. 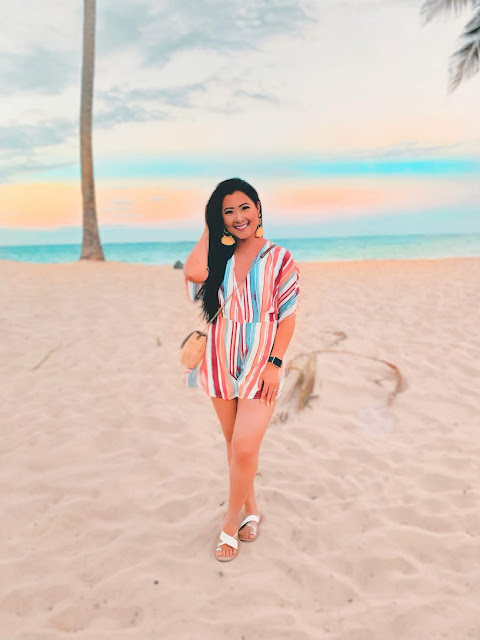 My travel style is one with a focus on hitting up the “touristy” spots, eating good food, and allowing plenty of time to enjoy the location for the day. With that in mind, I really planned out our itinerary to hit two, three max spots in a day. The best part of traveling to Puerto Rico from stateside is that you will still have cellular service. This was essential, especially for when we were driving to places and needed to use Google Maps. You can still text and call as you usually would. Puerto Rico was hit by Hurricane Maria and although their recovery has been impressive, as you walk the streets or visit certain areas you will see the impacts. All the more reason to visit Puerto Rico and boost its economy through tourism. The people in Puerto Rico are also some of the nicest that we have met. Two times, strangers assisted us. The first time was when we were waiting for our rental car shuttle at the airport and once on Vieques when we were stranded without transportation a local took us in his very own car to the beach we had our eyes on. Puerto Rico is an island in itself and then has two other islands that are only accessible by water or air called Vieques and Culebra - both come very highly recommended. You can access one end of Puerto Rico and travel to the other end in the span of about 2.5 hours. You will have access to beaches basically anywhere that you go and most people can speak perfect English. If you speak Spanish that is a plus but not really needed! I would bank on everything taking about 2-3x longer than it normally would for anything you do in Puerto Rico including - ordering food, waiting for a taxi, taking care of logistical items like getting a rental car, etc. Especially when you get to an island like Vieques make sure to call a rental car 45 minutes ahead of schedule so you don’t miss the ferry back to the mainland. The entire time that we were in Puerto Rico, my husband and I never felt threatened. Certain areas look very rough but we noticed very quickly that police were active and on multiple streets. We also stayed in San Juan and walked every night to dinner around 7:30-8 PM and had no issues. The #1 thing you will probably read when researching Puerto Rico is that you should rent a car when you get there. There is no UBER/LYFT service that will take you from the airport to your hotel or Airbnb and taxis are known to be overpriced. Once you are in the city, you do have the ability to call an uber but if you plan to visit notable spots like El Yunque and Playa Flamenco (the #1 recommended beach in Puerto Rico) you will be driving at least a minimum of 45 minutes to those destinations. Your Uber bill can get pretty high so just keep that in mind. You have two options once you do get to Puerto Rico - rent a car and drive to the destination spots you desire OR book excursions to the destinations but. That can get pretty pricey. 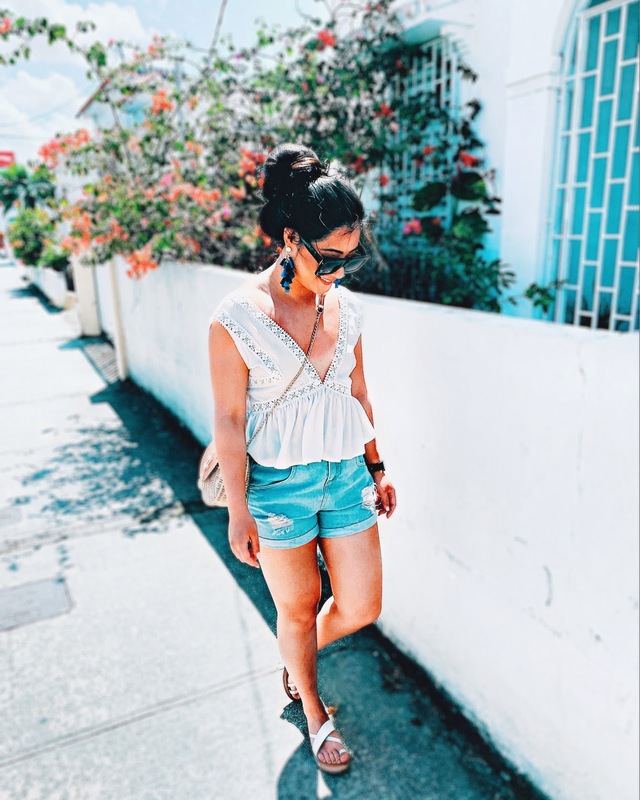 Additionally, if you are staying in a location other than San Juan the excursion companies may tack on additional transportation fees so just compare the two when you are planning your trip. We opted to get a car and splurged on one excursion which provided transportation to Culebra. When you are renting your car, be wary of the “estimate quote” that you receive. I rented our car from Expedia and from a company called Payless. I had not read up on any reviews on this company and later found they received a F rating from the BBB and had multiple 1-star reviews. Multiple customers had been scammed and charged for absolutely ridiculous things. Eek. We were quoted around $180 for a week of renting the car and left Payless having to pay closer to $300. Over $100 than we expected. Lesson learned, that will never happen again. The experience was terrible only in the beginning, this particular rental company was one that was not located within the airport which was the reason for their “lower” rates. We had to call for the shuttle and ended up waiting over 45 minutes at the airport for the shuttle to come. In the end, it never actually came. An employee from another rental company actually came over and took lead for us and called Payless multiple times for us with absolutely no answer on their end. Finally, he was able to flag down a car from another company called “Dollar” that was apparently their sister company and told them to drop us off. If that man hadn’t been their that night I have NO idea how long we would have been waiting at the airport. The employee that took care of us that night was helpful. I went in wanting to add collision damage and the bill came out to $400 so he let us use our own insurance to bring that cost down. I was still extremely disappointed by the additional charges and in the end, I’m sure we paid just as much as we would have if we rented at the airport, especially with all of the obligatory hidden fees. I would highly suggest you go with a reputable company that is located at the airport for easy pick-up and drop-off. Even if their rates are a bit higher at least you will be guaranteed to have the prices you were quoted and you won’t have to worry about being scammed when you drop off the car. Our return was pretty smooth but I read horrible reviews about come customers getting charged for a “nick” that had already been there that had apparently gotten bigger and also the rental companies giving out cars that had been patched up and customers having to shell out hundreds to replace the tire. All of these are absolutely terrible and I wouldn’t wish that experience on anybody so just go with a reputable company, I cannot emphasize this enough. We stayed at a cozy one-bedroom Airbnb in San Juan that was the perfect location from the beach and from restaurants. This one fit all the boxes. Additionally, the interior was modern and renovated and I could tell we wouldn’t be in a unit that was run-down. I would also read up on reviews if you plan to stay in an Airbnb and make sure the unit has working A/C and hot water. I have also heard wonderful things about The Dreamcatcher if you are not an Airbnb person. Cash - Joe and I brought a total of $300 in cash and only really dug into about $200 of it. Many restaurants take card and even when you are in places like Vieques and Culebra they will probably be able to take card (with a minimum of about $5). You don’t have to convert your money which is awesome! There are ATMS around if you do need cash, just make sure you have an idea of the fees that you’ll be charged for withdrawing. Old San Juan: pastel colored streets bustling with shopping and restaurants. Make sure to check out El Morro, your $7 admission gives you access to El Morro and San Cristobal for 24 hours. While you’re there, check out the streets with the pink umbrellas for a great photo opp. If you are interested, go on the Bacardi Rum Tour. Bioluminescent Bay: There are multiple bioluminescent bays that you can access either in Fajardo or Vieques. Take your pick depending on where you plan to stay the night. Culebra: Also only accessible by ferry or air from Ceiba Ferry Terminal. Go to Playa Flamenco, the #1 recommended beach in Puerto Rico. Check out Tamarindo for turtles. Go to Playa Zone for a secluded experience. Lago Dos Bocas - check out the Seralles Castle and the Cabo Rojo lighthouse. *Acapulco Taqueria Mexicana - we literally ate here 4 times because we loved it so much. Get the Burrito Maria and the corn! *Casita del Miramar - incredibly fresh, beautiful, authentic Puerto Rican dishes. We had an incredible experience and it was recommended by a local. *The Mezzanine - at happy hour certain drinks and apps are $5 each! *Punto de Vista - a rooftop restaurant, I was not impressed by my meal but it is a rooftop! 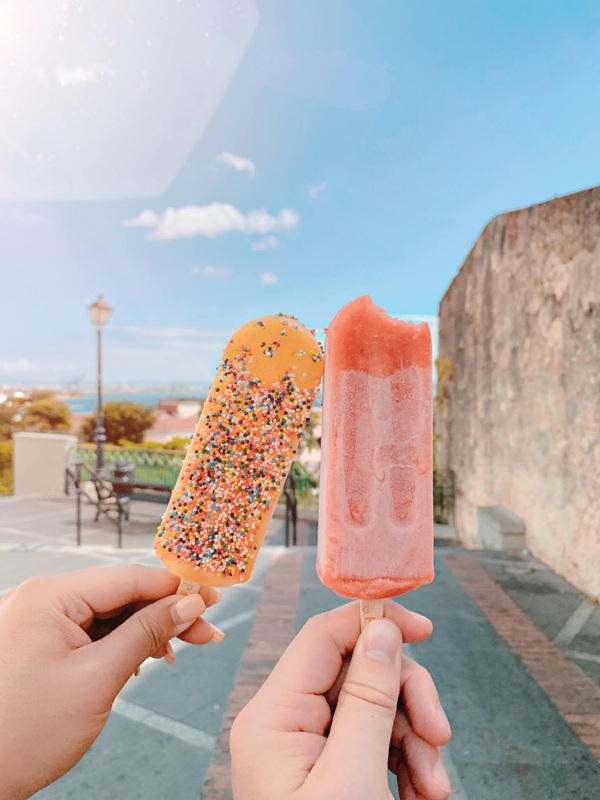 *Senor Paleta - definitely grab a popsicle here while you are exploring the streets of Old San Juan! Whew, that was a LONG post! I hope that it gave you the information that you needed to plan a trip to Puerto Rico! We really enjoyed our time and I would definitely visit again to see the spots that we missed out on this time around. To my readers that stop by, I love you guys! January was both the longest month but it also flew by.. a lot of things happened. We got a puppy, I went to Vegas for a week for work, we hosted friends for dinner, I got back into a groove of working out, etc. It’s funny how quickly life flies by. I feel like I barely had time to sit down and process the fact that it’s actually 2019. - And on top of all of that, maintain a social life and be a good daughter, sister, friend, and mentor. Whew, typing all of that out and seeing all of the things I’m trying to balance is a bit overwhelming but it always helps me to sit down and process and number my priorities and goals. Would you join me for this month’s goals? If you feel overwhelmed and like you have too much going on, sit down and give yourself some grace. Plan out your days but also make sure to allot more than enough time for yourself to make some mistakes, for a project to take longer than anticipated, and to soak in the little things that give you joy. For all of my type A readers who are like me, I know that this is probably hard for you and you just want to be on the go go go all the time, but trust me, your happiness is greater than any goals you achieve. And Christ is greater than EVERYthing. - I actually finished “Girl, Wash Your Face” because I had a 5 hour long airplane ride to Vegas. I loved it! I have a lot of things on my list of goals that I’ve had to put on the backburner because it’s more important for me to prioritize my marriage, taking care of Banjo, my career, and my relationships but I’m trying to strike a balance and still achieve as much as I want to every day. If anybody has any good time management skills / books to share, I’d love to hear them in the comments! !